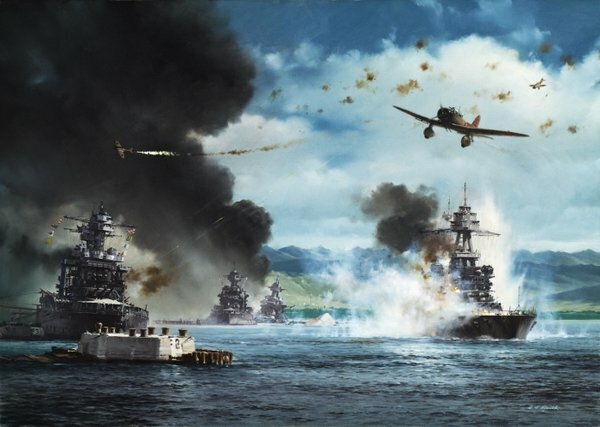 "A DAY OF INFAMY - JAPANESE ATTACK ON PEARL HARBOR"
The attack on Pearl Harbor on 7 December 1942 was the beginning and the defining moment of WWII for the United States. The surprise attack was devastating, killing over 2,400 servicemen and wounding another 1,100 along with the destruction of 300 aircraft, three destroyers and damage or destruction to a number of other ships. Of our seven battleships moored at Ford Island in Pearl Harbor, the USS Nevada was the only one to get under way during the attack.